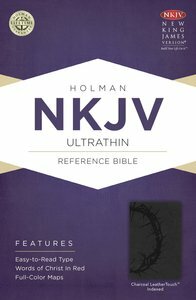 About "NKJV Ultrathin Reference Indexed Bible Charcoal"
This NKJV Ultrathin Reference Bible offers the best of both worlds; it&'s easy to carry and easy to read. Just over a half-inch thin, this time-honored Bible slips into a purse, briefcase, or backpack. Yet, its crisp printing, nine-point type size, and unique opaque paper make it easy on the eyes&-whether reading in church or during personal study. With exceptional quality and affordable gift giving prices, its features include: words of Christ in red, 66-page NKJV concordance, presentation page, family records section, introduction to each Bible book, center-column cross references, ribbon marker, an eight full-color maps.